Here’s the "mail art" I did Saturday...very last minute...so last minute that I had already sealed it and wrote the address info on it (I’ve blurred that info on the pictures), and was getting ready to put on the postage when I realized just how big and "BLAH" it looked! I’ve been playing with my glimmer mists, so any white surface just screams out, "spray me, glimmer me, make me pretty!" So I carefully unsealed the back of the envelope, grabbed three colors of glimmer mist (patina, copper and gold) and started spraying away. where she put her glimmer mist stencil on top of the glimmer mist (instead of on top of a bare surface and then glimmer misting over the stencil), put a paper towel on top of the stencil and then brayered over the paper towel. It made the glimmer under the stencil look darker because some of the color was absorbed by the paper towel. I really love that effect. Jose was headed to the mall with Kathryn shortly, and he was going to take this piece of mail with him. I had promised Liz I would get it in the mail that to her that day. By now, my envelope was quite wet so I hurriedly took the heat gun and started drying it, front and back. Of course, some but not all, of the color had soaked through to the back of the envelope, so I sprayed the white spaces on the back as well and continued heating until the whole thing was dry. 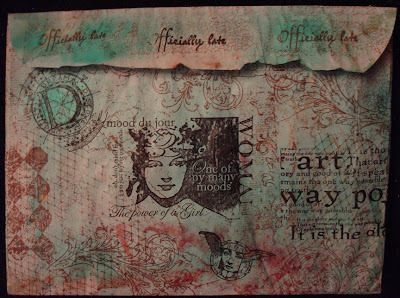 Then I grabbed my swirl and text stamps (by Tim Holtz) inked with Versafine Sepia and stamped the edges of the envelope. Then I stamped the bird on the branch and the crown (both from Tim Holtz’ acrylic set sold at Michaels) with Versafine Onyx Black ink. I very lightly scribbled (so it would dry quickly, especially with the help of my heat gun) Diamond Stickles on some of the swirls and on the crown tips too. 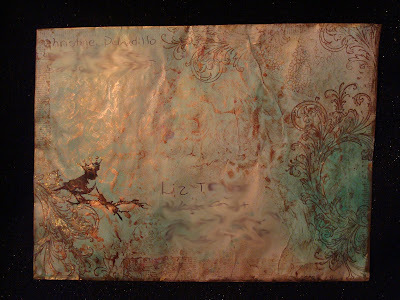 I used my gold Krylon marker on the outside edges of the envelope. When I went to seal it, the back looked pretty but needed some stamping too, so I grabbed an assortment from my stamp wall and quickly stamped away -- no time for thinking...just stamp! Here’s the back of the envelope. The whole thing took about 10 minutes -- and I finished just in time to put the stamps on and hand it to Kathryn to take to the mall for mailing. She’s so sweet...when she saw the envelope she said, "I bet that’s the prettiest envelope the post office has ever seen!" So Liz should be receiving that envelope today—I hope she likes it. In addition to the things I needed to send to her, I also sent her a card I made and the "Smile" ATC that I posted yesterday. Liz has taken some classes from me and always sends me such sweet and inspirational emails after class. She also brings me the most amazing origami art made from money as "thank you" gifts. 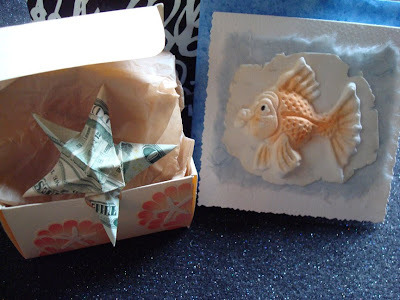 Here’s an origami starfish she made from a $20 bill (there’s no way I’m taking that apart!) And the paper mold fish card is adorable . Liz told me she made the fish card a long time ago, back in the days when she was feeling creative, and now after taking a class from me, she said she was feeling creative again! That little bit of information was the greatest gift to me! 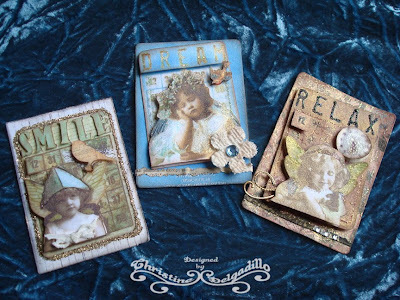 I still have the "Relax" ATC, so if you’d like it, just leave me a comment, and I’ll get it to you. 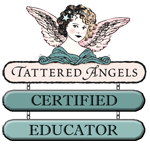 Once again, I’ve neglected my blog...but it’s a new year and I hope to post a little something to share with you at least weekly. I haven’t been creating much in December. Like everyone else, I've been busy with the holidays, but then to top it off, the flu ran through our household beginning with Jose in mid-December, followed by me, and then Kathryn got the flu just before Christmas, but hers wasn’t the regular flu, she got the special H1N1 flu! We got her to the doctor very quickly, and she recovered much quicker than both Jose and I. Now that we’re all done with the holidays, and the flu, I started some much needed cleaning of my scrapbook area, and came across something to share here --- some ATCs that I made back in October using images from The Art Life that I picked up at a not so local scrapbook store. I just cut some of the images (these old eyes needed closeup glasses for that), added dimension by layering and popping them with popdots, and added Stickles. They are finished off with a quick spritz of Iridescent Gold Glimmer Mist. 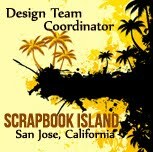 The "Dream" ATC (center) has a recycled background which is from a suede-feeling perfume box (click on the image to make it larger, and you can see the product writing on the bottom center) given to me by my friend, Jean. Jean knows I like boxes and containers so she's always giving me fun little doo-dads to recycle and create with. Capturing the shimmery goodness that Glimmer Mists leave behind is kind of hard to photograph...they are so much better in real life. 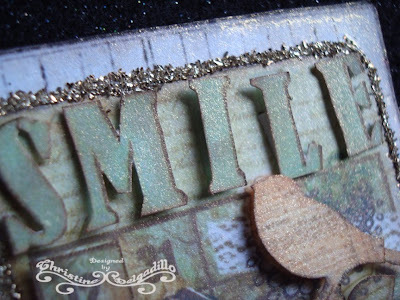 Here’s my best attempt at a closeup of the "Smile" ATC showing the shimmering Iridescent Gold Glimmer Mist on it. Click the image to make it larger for a real closeup view.